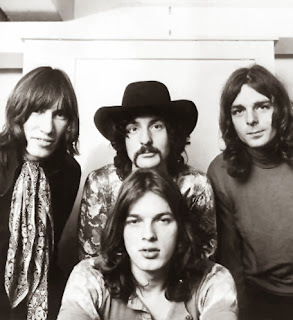 Today in the rock room I am exploring a FM broadcast of three songs and a interview from Dutch radio of Pink Floyd, hailing from May 1968. These tracks come from the groups performance at the Palazzo Dello Sport in Rome, Italy for the First International Pop Festival. Other bands on the bill included the 'Byrds'(with Gram Parsons) and the 'Nice'. 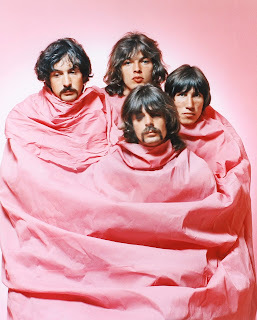 Mid 1968 was a strange time for the group who were in the process of reinventing themselves after kicking principal songwriter and group founder Syd Barrett from the band. According from the text 'In the Flesh' this concert is from May 5th, the CD packaging says May 6th, which I believe may be the broadcast date. This is like previously stated a FM broadcast so the sound is relatively good with proper levels and nice clarity. The recording has only 3 songs and an interview, so it is a quick but enjoyable listen, from a interesting period for the band. The group during this performance is a four piece featuring Roger Waters (Bass, Vocals), David Gilmour (Guitar, Vocals), Richard Wright (Keyboards, Vocals), and Nick Mason (Drums), this would remain their line up until 1979. The concert begins with the MC's introduction along with the radio broadcasters introduction. The first track is the Morse code opening of Syd Barrett's 'Astronomy Domine'. The first song of the groups debut LP sneaks out with dramatic vocals and percussive statements. The instruments tumble and fall like ancient stones, dropping into an abyss of descending chromatic runs dressed in enigmatic organ swells, and cymbal washes. The song tumbles over itself weightlessly, often referred to as 'space rock', the band was not enamored with that term, but it is quite apt in some cases. The song balances on its quirky changes, moving through the falsetto howls of the chorus, and eventually peaking in a heavy reinstatement of the theme. The next track on the recording is an interview with Roger Waters where he states his beliefs regarding the staging of a pop festival in Rome, and the misgivings of doing so. He is also asked about the 'progressive' or 'experimental' aspect of 'pop' music and where the Floyd fits in to this movement. Interesting listen. The following song is the strange and abstruse 'Set the Controls for the Heart of the Sun' penned by Roger Waters. The tune which would remain in Water's set lists in different arrangements for years, here is played early and close to its original ideal. Opening on hollow tribal tom tom rolls that on the studio version were played with Tympani mallets, the song slinks along without bass and containing only terror inducing keyboards and Waters sinister whispers, 'Witness the man who raves at the wall, making the shapes of his questions to heaven'. Gilmour's muted cotton covered riffs move in and out of the track like a snake in the grass, sliding up against Wright's keyboard statements. The clandestine mantra starts to gain momentum, rotating, gathering cosmic ice. Gilmore joins with an over driven tone, playing droning licks similar to Indian raga riffs. The song then again falls dynamically into just keys and woody drums, only to rise from the psychedelic ashes to a well placed peak. The conclusion of the song hangs draped like a veil over the parchment portrait of a spectral woman. Waters bass appears toward the end at around eight minutes to help usher in the ending smoothly. The bootleg recording concludes with 'Interstellar Overdrive', a song thematically related to the earlier ''Astronomy Domine'. The song begins on the chirp of Waters psychotropic guitar birds that squeak and squeal in conjunction with Wright's merry go round keys. The song becomes a cluster of celestial horses jumping stars, eventually becoming a weightless improvisation floating through dark recesses. The song becomes minimalist, similar to 1970 Grateful Dead 'Dark Stars' then enters into a Waters bass groove. Gilmour is throwing out strange schizophrenic statements, that quickly disappear after four minutes leaving Waters and Wright to gaze at each other through darkness. Formlessness becomes form, Mason comes thrashing in with weighty drums and the band coalesces into a thick reinstatement of the theme in a big way. A highlight of the recording. Brief applause can be discerned at the conclusion before the tape cuts off. Apparently only 400 people attended this performance, probably the reason for Waters negative comments during the interview portion of the recording. 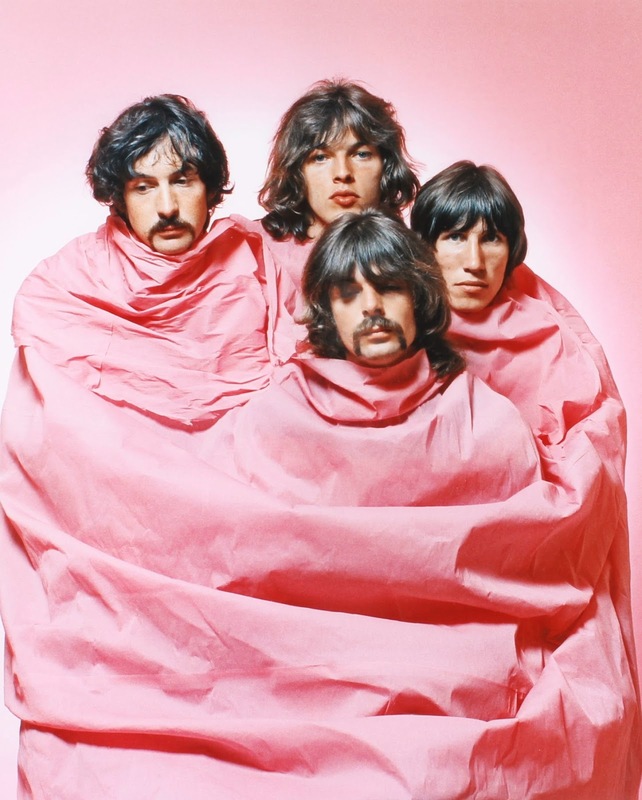 Regardless, this capture is a adequate sounding representation of Pink Floyd during a time of reinvention and musical questioning. While extremely short, it is a very enjoyable listen with more than a few highlights. While my discovery was because I was virtually thumbing through a hard drive directory of music to enjoy, and this one stuck out as needing a good solid listen. If it sits silent in your collection I would recommend doing the same. There is also available, limited filmed footage of Floyd's performance which some I have included below. This is a good reference to enjoy in conjunction with the audio. There is apparently more hidden in the depths of someones vault, but only time will tell.